When you’re the best-selling sports coupe in the entire world, you can probably just rest on your laurels and no one will think anything of it. But that’s not how life goes for the Ford Mustang. 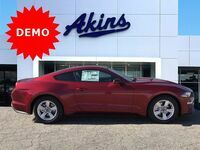 Instead, the new Ford Mustang is enhanced and upgraded each and every model year to be better than ever before. 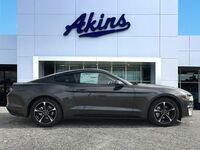 And that’s never been more accurate than when talking about the 2018 Ford Mustang, which we have right here at Akins Ford near Atlanta, GA.
That’s because the new Ford Mustang has been fully updated to become the most powerful and most technologically-advanced Mustang ever created, making it the perfect choice for anyone looking for the ride of a lifetime. You’ll see exactly what we mean in this 2018 Ford Mustang versus 2018 Chevrolet Camaro head-to-head model comparison. 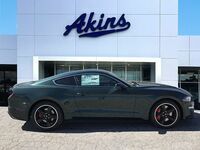 The majority of this comparison is going to focus on the engine and powertrain capabilities of the two models, but it should also be noted that the 2018 Mustang features some all-new systems that the 2018 Camaro can’t match, such as an available 12-inch all-digital LCD instrument cluster with optimized displays for Normal, Sport and Track Drive Modes, a MyMode feature that lets you save your customized drive settings and an active valve performance exhaust. 420 lb-ft. Max Torque 295 lb-ft.
One of the biggest surprises for the 2018 Ford Mustang is its new engine lineup, which does away with the standard engine of the 2017 Mustang in favor of a more powerful and more efficient 2.3-liter EcoBoost engine offering 310 horsepower and 350 pound-feet of torque. Conversely, the 2018 Chevy Camaro features a standard 2.0-liter turbocharged I-4 engine offering only 275 horsepower and 295 pound-feet of torque. Both the new Ford Mustang and the new Chevrolet Camaro also offer a second available engine. 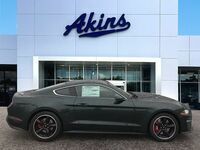 And, once again, the 2018 Mustang completely outperforms its competition. That’s because the available engine for the new Mustang is a 5.0-liter V8 engine offering 460 horsepower and 420 pound-feet of torque, whereas the available 3.6-liter DOHC DI VVT V6 engine for the 2018 Camaro provides only 335 horsepower and 284 pound-feet of torque. The only advantage the new Chevy Camaro can claim is that its best available gas mileage configuration gets a meager one more mile per gallon in the city. This difference not only won’t change much at the pump, it’s made even more inconsequential when you take the additional power you’re getting with the new Ford Mustang into consideration. 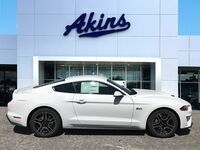 To learn more about the 2018 Ford Mustang, please reach out to our Akins Ford staff near Atlanta, GA.